Pioneers in the industry, we offer enterotone from India. 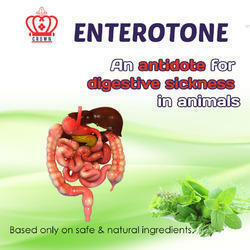 Crown Enterotone has special herbal medicines for treating diarrhoea and treatment against digestive disorders in birds and animals. The herbs acting in three different ways are formulated in it. It has medicines having wide spectrum action against bacteria, virus, fungus and non-specific agents causing digestive disorders. It relieves digestive distresses like amoebic dysentery, parasitic infection and other gastric disorders. It has immuno-modulators to build-up immunity against diseases. POWDER : Fine (mesh: 150-200) and dry powder. POULTRY : 1-2kg per Tonne of feed. Presentations : 1kg & 5kg poly pack. Presenation : 1 Litre & 5 Litre Plastic jars. ADVERSE EFFECTS : Since the ingredients used are natural herbs, no adverse effects are likely to occur. Looking for Digestion Aiding Herbal Feed Additive ?